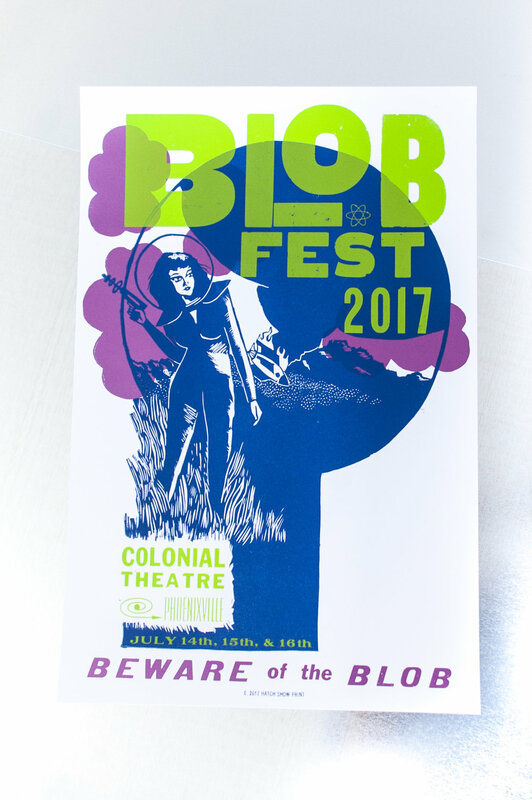 Each year in Pheonixville, Pennsylvania fans of 50s Sci-fi films converge to celebrate "Blobfest." Vintage films are shown at the historic Colonial Theatre, which made it's own film debut in the 1958 flick "The Blob." This feature film was the inspiration for the festival that attracts all sorts of sci-fi and horror fanatics and aims to celebrate film and genre. "Blobfest" has been a regular client of Hatch Show Print for quite some time and is one of the only clients yet that doesn't ask for a proof or pre-printing approval. For this project I had free rein over not only what the poster looked like, but also the theme and copy. I wanted to pink blobs in the back to be representative of "the blob." I wanted the type and colors to be reflective of that old-school sci-fi look, complete with fun dingbats and arrows. I was also especially lucky that Hatch had such a fitting space woman block existing in their archive.